Which Would You Take: Lightweight Porsche 928 or LS1-Powered Mazda Miata? I visited the secret laboratories of Evil Genius Racing last week, to see what manner of madness they had cooking. While there, I encountered a couple of track-car projects that presented quite a dilemma. I was really hoping to take a look at their Black Ops 24 Hours Of LeMons racer, but I was only able to shoot the single photo you see here prior to being hustled away from the vehicle by a squad of Phone Police. Still, it's a clue! The Black Metal V8olvo was there, in the Evil Genius Purgatorial Parking Area. There will be a new theme for the 302-powered Volvo DL at the Goin' For Broken race in Nevada; more on that soon. Here's another potential LeMons car, though the EG says he can't quite bring himself to beat up such a solid, restorable 240Z, regardless of initial price tag. Check out that custom instrument panel! The previous owner of this car was celebrating National Day Of Slayer year-round! Then there's the World's Nicest Fiat Spider, which is definitely be the most original early-80s Fiat I've ever seen. Over in the shop, Evil Clint was doing some welding on a project that earns a big Jalopnik Stamp-O-Approval™: a Mazda Miata with all-aluminum Chevrolet LS1 V8, T56 6-speed, and Lincoln Mark VIII 8.8" IRS rear. 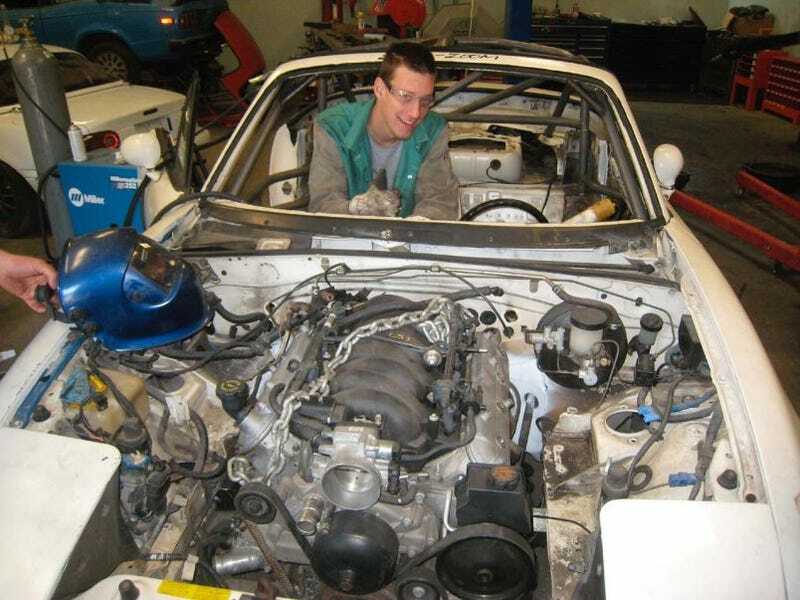 We recommend that all cars get their recommended daily allowance of Vitamin LS; in the case of this Miata, the end result will be lighter than the Mazda-engined car. How about 400 horsepower in a 2,300-pound car? I thought that was pretty cool, but then I saw this '87 Porsche 928 on the Evil Genius dyno. The engine is fairly close to stock and puts out a reliable 300 horsepower, which made the 3,700-pound 928 go pretty well… but this car has been put on a ruthless diet. Yes, there are many things a 928 really doesn't need- things such as headlights, door guts, etc.- and all of them have been torn out. With cage and a half-tank of fuel, it weighs just 2,850 pounds. Check out those 14" rear wheels. That's width, not diameter! Granted, this car has 550 more pounds and 100 fewer horses than the LS1 Miata, but I don't care- I prefer the Porsche! What do you say? Gutted 928 or Chevy-fied Miata?